Retired after a thirty-six year career with the US Forest Service, Jim has returned to an early love of oil painting. Jim’s career blessed him with the opportunity for week long pack trips, time “in the saddle,” business conducted around campfires and lots of experience in some of the most spectacular western scenery imaginable. 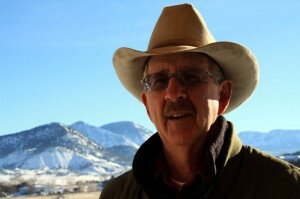 Born in Jackson, Wyoming and raised in west central New Mexico, Jim graduated from New Mexico State University in 1971. Jim and his family lived in various villages and small towns in New Mexico, Oregon and Colorado during his time with the Forest Service. Upon retiring, Jim and his wife, Carol moved from Gunnison, Colorado to Crawford on the western slope of Colorado. They established ‘Saddle Mountain Studio,’ the name inspired by the dominating view of Saddle Mountain from his studio window.